On January 22, 2018, The Edmonton Arts Council and City of Edmonton announced the 14 public artworks for the Valley Line Southeast LRT at City Hall. In-depth look at planning and history of the Valley Line Southeast project, plus southeast portion route maps, August 2016. There are a lot of things to consider when building an LRT line. As projects progress details like design, agreements, impacts and reporting become defined. 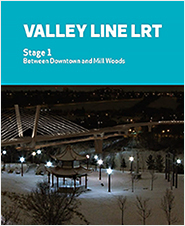 A major priority of the Valley Line project is to design a transit system that both meets the overall goal of LRT expansion and fully integrates into the communities it serves. Through direction from the City and two years of public consultation, an extensive list of design guidelines that emphasize Sustainable Urban Integration (SUI) was established. SUI looks beyond the building of tracks and trains to create neighbourhoods that are safe, attractive and connected. This involves designing livable, pedestrian-friendly environments and adding enhancements that reflect the feel and character of each of the communities along the LRT corridor. City Council has accepted the recommendation of the Transportation Committee and approved updates to the Environmental Impact Screening Assessment and Site Location Study. These updates include minor adjustments to the Project Area in the North Saskatchewan River Valley made in response to stakeholder concerns identified during the preliminary design process. The Transportation Committee made its recommendation on March 25, following a non-statutory public hearing which featured presentations from LRT Design and Construction, citizens, and community groups. Explanation of Freedom of Information and Protection of Privacy (FOIP) redactions on the Project Agreement. Third party confidential information (s. 16). Is a trade secret or commercial, financial, labour relations, scientific or technical information of a third party. Was provided to the City in confidence. reveal labour relations dispute information. Generally, names and personally identifiable information have been redacted to protect personal privacy. Information which could reasonably be expected to interfere with public safety. In particular, information about surveillance or security systems and specific requirements for access and egress for public facilities may fall under this category (unless it is a reference to compliance with codes or standards). Harmful to law enforcement (s. 20). Information that could harm the effectiveness of investigative techniques or procedures. Advice from officials (s. 24). This section only applies to information which reveals the City’s plans or positions as it relates to parties other than TransEd which could interfere in the City’s future negotiations with those other parties. City’s economic interests (s. 25). Interfere in the City’s negotiations. As part of an ongoing commitment to transparency and accountability, the City releases periodic reports to provide an overview of progress and performance on the Valley Line Project. These reports include a summary of work completed by TransEd Partners and the City. City Council considered the impact on property owners when approving the route for the Valley Line LRT and ultimately selected an alignment that minimizes the need for the acquisition of private property. However, in some cases, privately-held property will need to be acquired in order for the project to move forward. Potential property needs for the Valley Line were assessed during the preliminary engineering process completed in 2013. If a property owner and the City property agent cannot reach an agreement to purchase the property, the City may proceed with expropriation of the property as a last resort.